Available for the first time in over 50 years, this extraordinary light-filled home is situated on a tranquil cul-de-sac. The main level features a welcoming foyer opening into a generous living room with a wood burning fireplace. The adjacent sunroom and dining room, designed by Wiebsenson & Associates, features floor-to-ceiling windows that showcase the lush gardens. The chef’s kitchen and dramatic Hugh Newell Jacobsen’s designed breakfast room open to a quiet deck and offer views of the pool and gardens. Up a small flight of stairs, the Dickson Carroll-designed master suite offers soaring ceilings and a private deck. The upper level offers three generous bedrooms with hardwood floors and multiple exposures, two baths plus a study/office. The finished lower level, also designed by Dickson Carroll, offers a recreation room with a whimsical ceiling treatment and fireplace, kitchenette, a large and bright laundry room, two full bathrooms, and outside access. The thoughtfully designed interior spaces give way to the lushly landscaped private gardens and terraces, decks, and heated swimming pool, all designed for refined entertaining and personal comfort. 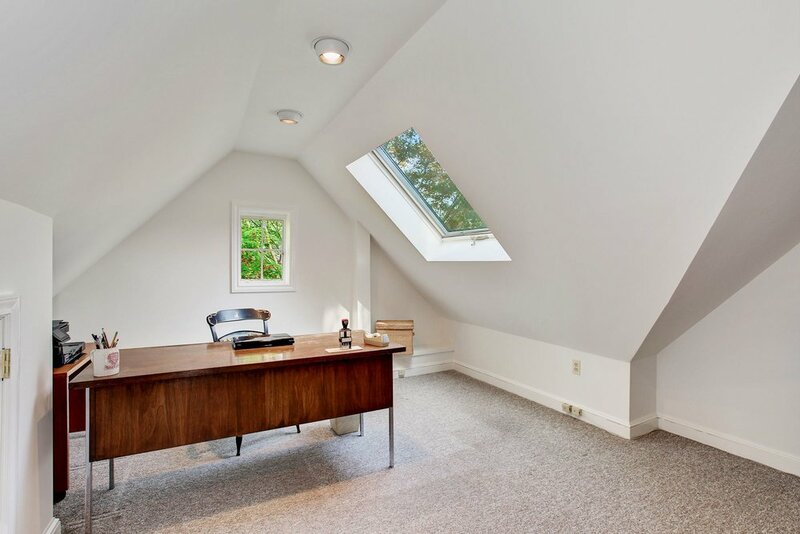 Offering tranquility in the heart of Chevy Chase, this rare property invites “staycations”.